8 posts categorized "Easter In Our Home"
And, Easter is my favorite holiday. It is a time of rebirth and renewal. The knowledge that Jesus died for our sins. And, rose to join His and our Father in Heaven. to share our love and gratitude. Come on in and join us for brunch. to share this tablescape with you. to accompany these dinner plates for years. I even asked you for help here. It just goes to prove patience pays. Because I love this combination. Everything you need for a smile. "penthouse sale" on the ocean in Fort Lauderdale. and I purchased the table runner from this Etsy shop. I found the darling napkin rings on clearance at Pier One. but I still needed those perfect dessert plates. Then one day there they were at another great Etsy shop. What would I do without Etsy? This year I decided we would have Easter Brunch instead of Easter Dinner. The timing worked better for our family, and it was a nice change. I served a nameless egg casserole. Nameless because I didn't have a recipe. I used a rectangle glass baking dish, and first put a layer of whipped potatoes, melted butter and panko crumbs which served as a crust. Next I layered slices of Canadian Bacon, whipped eggs and grated cheese. I baked it at 300 degrees for 30 minutes, and the family reviews were good. I also served oven-roasted asparagus spears, biscuits with butter and fig preserveres and a fruit salad with mango, papaya and pineapple chunks. The Easter table is always my favorite. 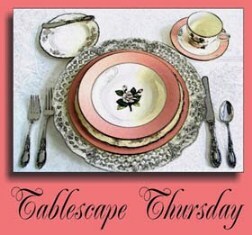 I love the soft pastel colors I tend to use in my Spring tablescapes. This year I used a pale yellow tablecloth which I purchased several years ago at Bed, Bath and Beyond. The napkins are a baby gingham of mixed pastels which I found at Pier One, and the napkins are overlayed with a sheer cover I found at Carolina Pottery a few years ago. I also used two Battenburg Lace napkins under the centerpiece. The chargers are also from Pier One, and I believe they are available again this year. The dinner plate is White Centura which I chose as my informal dishes when we got married over 42 years ago. The top plate is Fire King Jadite in the Alice pattern which was produced in the 1940s. The white lotus bowls must be close to 40 years old, and I purchased them at World Bazaar in Fort Lauderdale. I decided to use my mother's sterling flatware. The pattern is Formality, and she got it when she married in 1950. I have always loved the delicate simplicity of this pattern. And, do you see my new dragonfly napkin rings? I have been wanting some for years, and I just didn't want to pay the amount on the price tag. The week prior to Easter I happen to find these in Tuesday Morning. The only problem was the beads for the bodies were black and dark purple. No problem. I used my silverleaf marker, and now they are just what I wanted. I also found those little wood carrots when I was in Tuesday Morning. You may remember my glasses. My cousin painted the flowers on them for me over twenty years ago. They are a go to favorite for me. And, those darling pastel ceramic mini-baskets I first saw at On Sutton Place. Ann said she found them at Kroger, so I headed my car in that direction. I really wanted six of the white, but they only had two of each color. That worked for me, and I think they are so cute. The jelly beans were a big hit, too. I decided to use the same centerpiece I already had on the table, and just surrounded it by some pretty daisies and fun egg-filled nests. We had a wonderful Easter. It is my favorite holiday. Now, I have to wait another year to wear my Easter bonnet. I hope your day was joy filled, too. using the linking tool provided at the bottom of this post. So, show us your Pink by linking your pink post permalink. within your post so that your visitors will be able to visit here. I promise it is worth the effort. you will meet incredibly nice and talented people. include that blog and a link in your post. and have met some great Pink Saturday participants. Most Clicks on Pink Saturday, March 23. Pink Saturday at How Sweet The Sound. Did you see Jillian's post? vintage pastel LuRay last Pink Saturday. You can visit her post here. to see which is the first one to catch my eye. Wow! There were some great thumbnails last week. This is the first one that caught my eye. share in all the joy that is Denise. Follow the above link in case you missed Denise's post. for making Pink Saturday special. Today I am sharing our Easter dinner tablescape. As you all know, yellow is my favorite color. And, Spring is the perfect time to celebrate yellow. I had not yet arranged the chairs. Thank you for all of the inspiration, Susan. Let's Dish at Cuisine Kathleen. This is our Easter Dinner table. Iced beverage glasses - Pink Depression glass Mayfair pattern. Our sweet LaVoice at Thoughts from Meme's Corner found some of these at an antique store where she lives, and purchased and mailed them to me. I just need a few more, and my set will be complete. Small ducks and lamb - Department 56 releases an Easter figure every year. I have about twenty of these figures. Easter preparations are going on behind this door. My favorite season is Spring for so many reasons. I feel a spiritual renewal with Easter and all that it represents. It is a time of rebirth for all living things. God has given us so many blessings. I love the colors of green that begin to surround us as leaves begin to return to the trees, and as bulbs begin to spring from their winter retreat. And, all of the beautiful blooms that occur. The ever present and faithful dogwood, and the bright colors of the daffodils. Oh, and the breathtaking hues of all of the azaleas - all shades of pinks, corals, lavenders and whites. Today on my way to work I not only saw daffodils blooming, but additionally there were blooming pear trees, tulip trees, pansies and many others. I make a point of taking different routes to work so that I can enjoy beautiful views each day. I love Easter bunnies, and young children dressed in their new outfits. I love Easter baskets and Easter egg hunts. And, of course, chocolate bunnies. When I was growing up we always had a special dinner for Easter. My mother always baked a ham, and she served it with many other delicious dishes. Now, I so enjoy preparing Easter dinner for our family, and everyone finds a special treat at their place at the table. So, if you come to our front door, be assured that Easter bunnies are welcome. Please come with love in your heart, and be careful not to step on any Easter eggs that may be hiding in our yard.